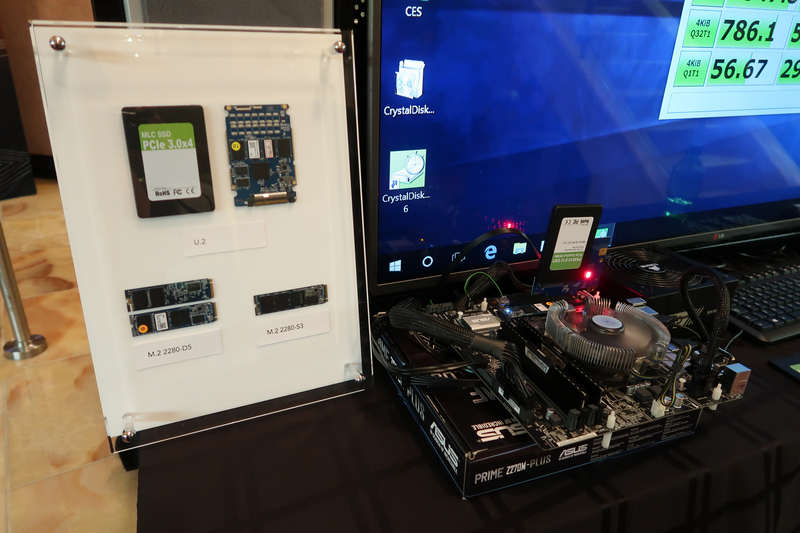 LAS VEGAS, NV — At CES, SSD controller vendor Phison is showing off a range of controller ICs and drive reference designs that are close to hitting the shelves. 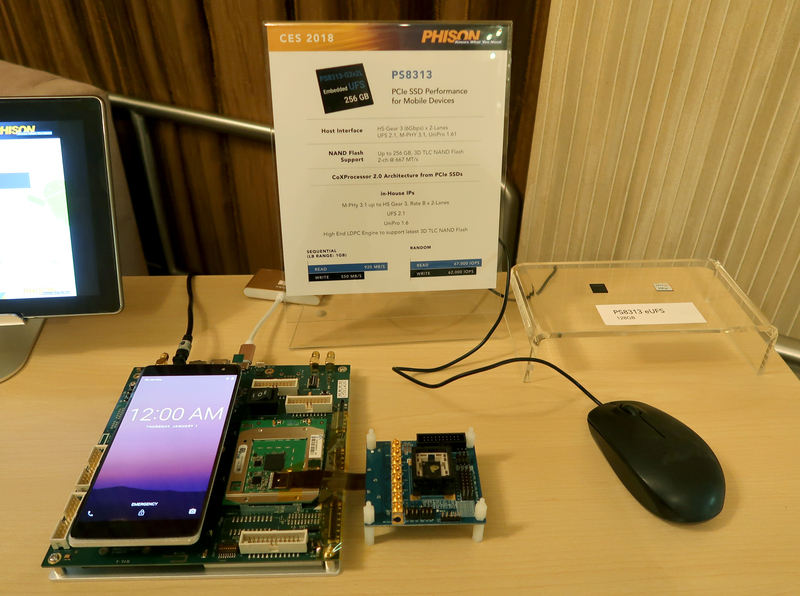 Phison’s second generation of NVMe SSD controllers has been on the roadmap for quite a while, but now the products are starting to become a reality. The PS5008-E8 and its DRAMless -E8T variant are Phison’s solution for the emerging low-end NVMe product segment. These controllers will be used with 3D TLC NAND flash memory, and their performance will be limited by the use of a PCIe 3 x2 interface instead of the x4 interface used by high-end NVMe drives. The DRAMless E8T controller supports the NVMe 1.3 Host Memory Buffer (HMB) feature to offset the random I/O performance hit that DRAMless SATA SSDs suffer from. The E8 series is in mass production using UMC’s 40nm fabrication process. MyDigitalSSD has already started shipping their SBX SSD using the E8 controller, and many other brands will soon be shipping products using the E8 or E8T. Phison’s PS5012-E12 controller is their high-end replacement for the current E7 controller, and it promises to bring much higher performance: over 3GB/s sequential transfers when paired with 64L 3D TLC NAND. Random reads and writes can hit 600k IOPS at high queue depths. It looks like this time around Phison will be much more competitive at the high end as NVMe SSDs start closing in on the limits of a PCIe 3 x4 link. 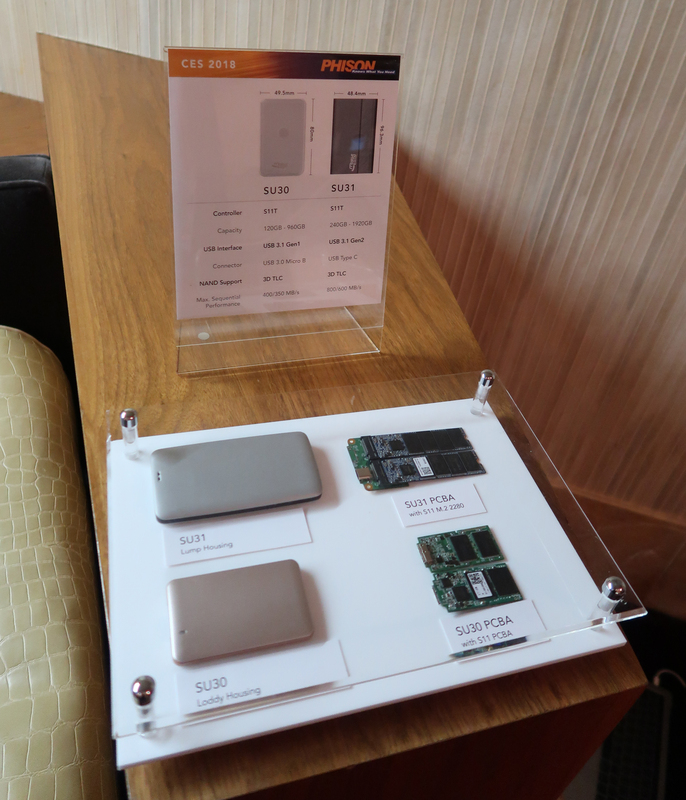 Phison is also showcasing their reference designs for portable Thunderbolt 3 NVMe SSDs. 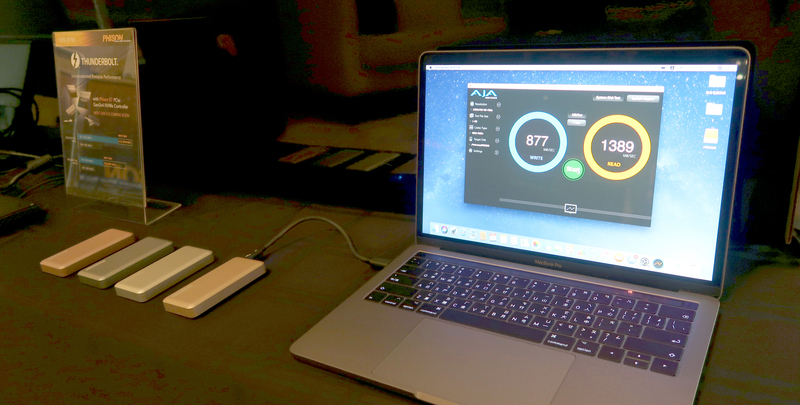 Portable SSDs are high-performance alternatives to USB thumb drives, and typically incorporate a SATA SSD controller behind a USB to SATA bridge. This is more expensive than a single-chip USB flash controller, but puts them in an entirely different league for performance and capacity. Most SATA-based portable SSDs internally use a mSATA or M.2 SATA module. A few products even use two SATA controllers in a RAID0 configuration to offer higher performance: we’ve tested the SanDisk Extreme 900 and Netac Z5. Phison’s Thunderbolt 3 SSDs will blow past all of them. Since these drives simply put a Thunderbolt 3 controller and a M.2 NVMe SSD in a portable housing, it’s trivial for vendors to create products based on any of Phison’s three NVMe controller options, but the most common configuration to hit the shelves will be with the cheapest E8 controller. Patriot is already showcasing their version of this design. 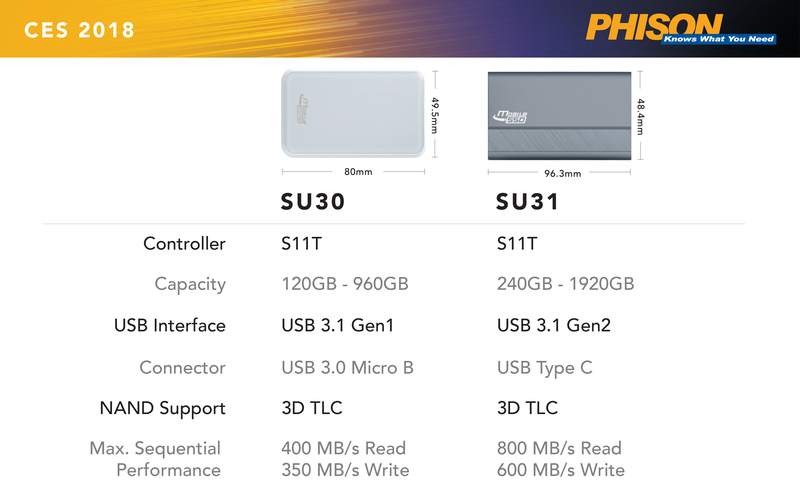 In addition to the Thunderbolt 3 SSDs, Phison is also showing SATA-based Portable SSD designs using one or two of their DRAMless S11 controllers, which was their first controller to support 3D TLC NAND. 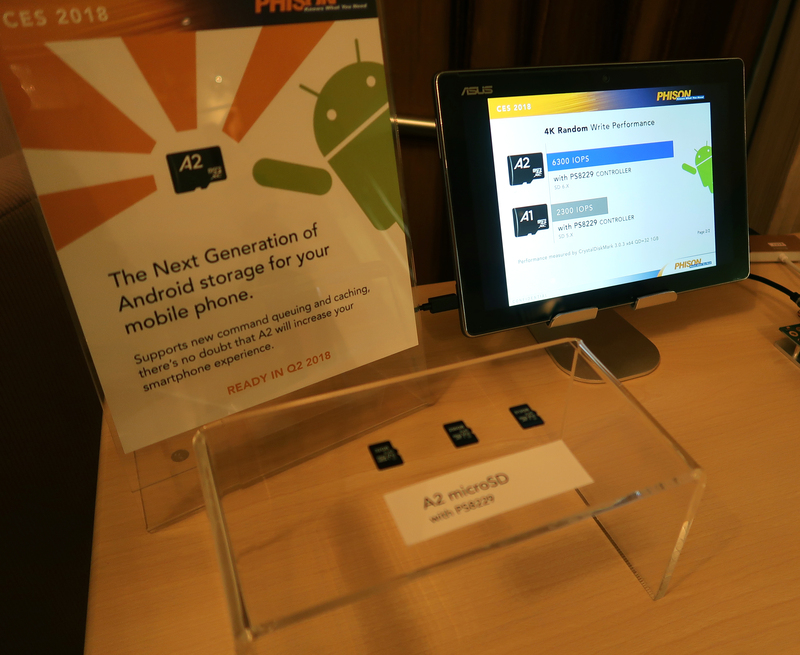 For the mobile market, Phison is also demonstrating their embedded UFS solution for high-performance storage in smartphones and tablets. The new PS8313 controller supports twice the capacity of their current PS8311 thanks to the addition of a second flash interface channel, and substantially higher performance with a two lane host interface. The upcoming PS8229 SD card controller will support the new features of the SD 6.0 standard and meet the requirements for the A2 application performance class when used with a SD 6.0 capable host. This controller is expected to be ready in Q2.